T4 DNA ligase is an ATP-dependent ligase that catalyzes a joining reaction between DNA molecules. By joining the 3’-hydroxy and 5’-phosphate termini to form a phosphodiester, DNA ligases are absolutely essential for DNA replication and repair in all organisms. The phage-encoded T4 DNA ligase is produced during infection of E. coli by bacteriophage T4. The search for T4 DNA ligase stemmed from two discoveries during the early 1960s. Meselson and Weigle, and Kellenberger et al. discovered that genetic recombination can occur by the breakage and rejoining of DNA molecules; and Bode and Kaiser discovered that a large fraction of linear DNA from bacteriophage l is rapidly converted to covalently closed duplex circles soon after infection of the host (Meselson and Weigle 1961, Kellenberger et al. 1961, Young and Sinsheimer 1964, and Bode and Kaiser 1965). The race to find the enzyme responsible for this DNA joining activity is evident from the independent and nearly concurrent discovery of DNA ligases by five different laboratories (Gellert 1967, Weiss and Richardson 1967, Olivera and Lehman 1967, Gefter et al. 1967, and Cozzarelli et al. 1967). In 1968, Okazaki et al. discovered another function of DNA ligase: DNA may be replicated discontinuously, and short segments can be joined into continuous strands that make up the chromosome (Lehman 1974). Soon after, the widespread distribution in a variety of eukaryotic tissues including rabbit, rat, and lily microsporocytes was observed (Lindahl and Edelman 1968, Tsukada and Ichimura 1971, and Howell and Stern 1971). The gene encoding T4 DNA ligase was cloned by Wilson and Murray in 1979, and the primary structure and genetic organization of T4 DNA ligase was investigated by Armstrong et al. in 1983. Ligases were critical reagents in molecular cloning development and many applications in DNA biotechnology. There has been a recent rejuvenation in ligase research upon the discovery that most organisms have multiple ligases functioning either in DNA replication or particular repair pathways (Tomkinson et al. 2006, Ellenberger and Tomkinson 2008, Shuman and Glickman 2007, and Shuman 2009). 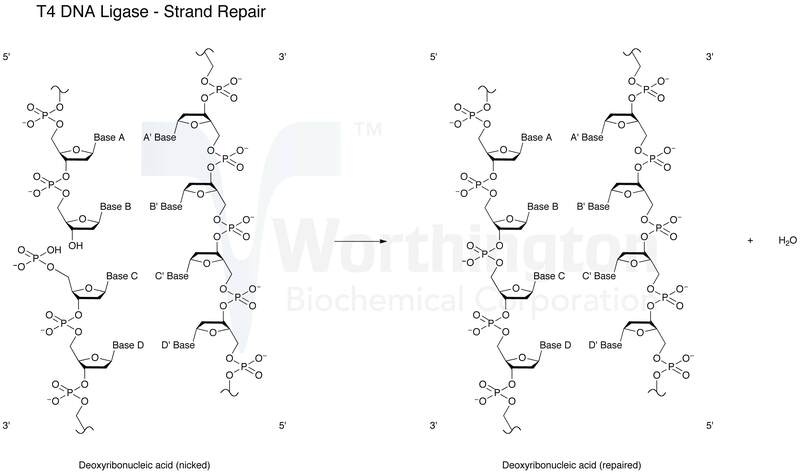 DNA ligases repair nicks in double stranded DNA with 3’ OH and 5’ phosphate ends. Typically, bacterial ligases are NADH-dependent, while eukaryotic ligases are ATP-dependent; however, despite T4 DNA ligase’s existence being confined within a prokaryote, it encodes an ATP-dependent ligase. T4 DNA ligase has a lower affinity for DNA than multidomain ligases, which could also explain its sensitivity to salt concentration. DNA ligation occurs in a three-step reaction. The first step is a nucleophilic attack on the alpha-phosphorus of ATP by the conserved lysine residue, releasing PPi and generating a covalent enzyme-adenylate intermediate in which AMP is linked to the terminal side-chain nitrogen of lysine. In the second step, a nucleophilic attack occurs on the phosphorus of the enzyme-adenylate by the 5’-phosphate-terminated DNA substrate, releasing lysine and forming DNA-adenylate. In the final step, DNA-adenylate is attacked by 3’-OH of another DNA strand, releasing AMP and joining the polynucleotides (Shuman 2009). T4 DNA ligase is a single polypeptide. Despite extensive purification of T4 DNA ligase, attempts to crystallize the protein, both with and without cofactor, have been unsuccessful. A similar structure, that of T7 DNA Ligase, has been solved (Subramanya et al. 1996, Doherty et al. 1996, and Shuman and Schwer 1995). Alignment studies of DNA ligases indicate a highly conserved central DNA binding cleft, active site lysine residue, and nucleotide binding site (Subramanya et al. 1996). T4 DNA ligase is a 487 residue protein. Bacteriophage T4 has a double stranded genome of approximately 169 kb, encoding 300 genes (Bullard and Bowater 2006). The genome of phage T4 is approximately four times the size of those of T7 and lambda, suggesting it undergoes less selective pressure to minimize the length of its DNA (Armstrong et al. 1983). T4 DNA ligase is encoded by gene 30 (gp30).